Reading this review does not require a prescription. Drinking water does not require a prescription. Supplementing Profiderall does not require a prescription. Yet, the company makes the point that you can take Profiderall… “without a prescription.” Why? Because users may associate Profiderall’s “-derall” suffix with Adderall, which does require a prescription. Yet, there would be no confusion whether or not Profiderall, a natural nootropic stack, would require a prescription if they didn’t employ this tactic in the first place. 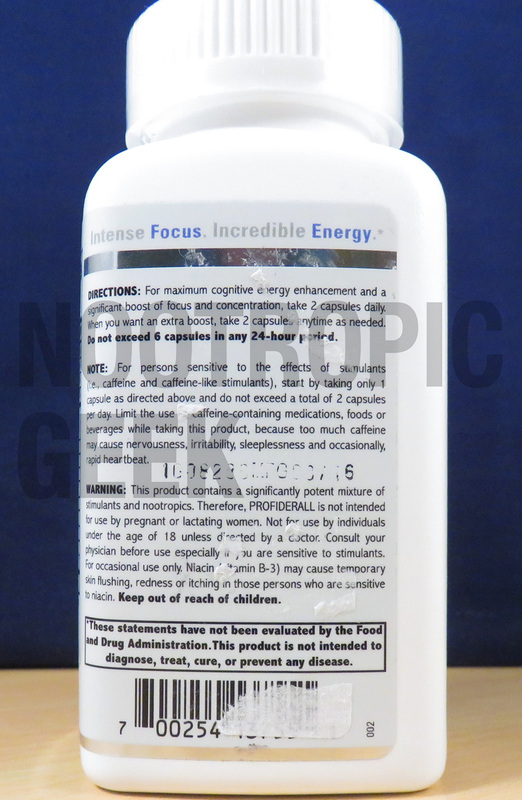 This is common among “smart drug”-substituting supplements as a means to attract to Adderall-using demographics. I have no problem with this. However, Profiderall doesn’t quite come across as an effective Adderall substitute. 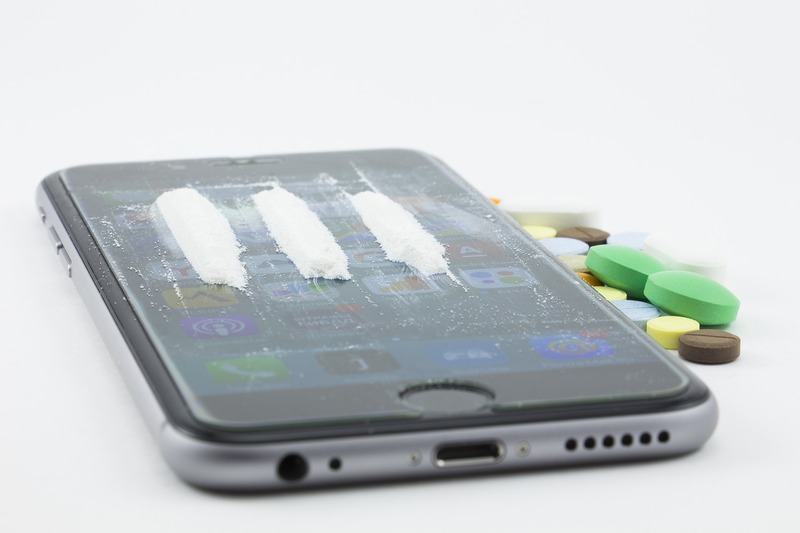 Profiderall is a clever play on the word “Adderall,” delivering a “Cognitive Energy Complex” that’s looking to supplant the smart drug industry. Many of the ingredients are popular items in energy drinks, namely the B vitamins & caffeine. The mental energy seems to err on the side of feel-good stimulation. Guess where Profiderall’s HQ is located? That’s right: San Francisco. I’m guessing this supplement is gearing towards the bio-hacking mental junkies of Silicon Valley. Other Ingredients: Rice Flour, Gelatin (Capsule), Dicalcium Phosphate, and Magnesium Stearate. Directions: For maximum cognitive energy enhancement, take two capsules daily. For a significant boost on focus and concentration, take 2 capsules anytime as need. *Do not exceed 2 servings in any 8-hour period or 6 capsules per day. B Vitamins – B3, B5, B6, and B12 are all present here, stacking up high doses of four mid-to-low quality B vitamins. Combined, these vitamins may enhance mood & mental energy, effects that become increasingly noticeable over time as risk of B vitamin-deficiency increases. More on B Vitamins. Bacopa Monnieri Leaf Powder – Cheap, plain powder form of an otherwise awesome adaptogen memory enhancer. Long-term supplementation of Bacopa is required to achieve peak cognitive benefits of this powerful herb. More on Bacopa Monnieri. Choline Bitartrate – Choline is great for the brain. It helps produce neurotransmitter acetylcholine for neuron-to-neuron synapses and phosphatidylcholine for cell membranes. But choline bitartrate is the wrong form as it has a hard time crossing the blood-brain barrier. Alpha-GPC (or even better: Citicoline) would have been the preferred nootropic options. More on Choline Sources. Taurine – Not sourced from bull testicles (but it is a major constituent of bile… yeck). Taurine is commonly found in energy drinks, yet is not a stimulant, but rather a decent neuroprotecting antioxidant with potential anti-stress sedative benefits. More on Taurine. 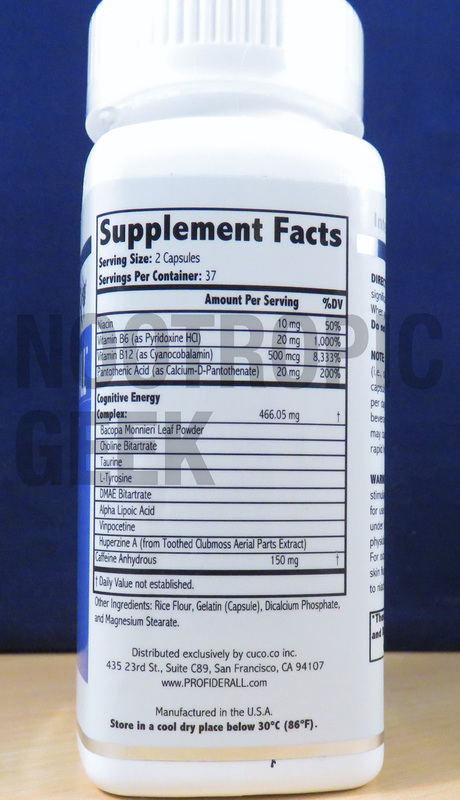 L-Tyrosine – Speaking of anti-stress benefits, L-Tyrosine is one of my go-to “as-needed” focus enhancers for its ability to diminish the negative effects of stress (and/or sleep deprivation). Although, I’d like to see the more bio-active N-Acetyl-L-Tyrosine form here. More on L-Tyrosine. DMAE Bitartrate – Boosts neurotransmitter acetylcholine, optimizes neuron membranes, settles agitated Theta brain waves, crafts ham & turkey sandwiches… Not really on this last point, but I wouldn’t be surprised considering everything else it does. More on DMAE. Alpha Lipoic Acid – The “Universal Antioxidant” is here to protect your neurons against free radical damage. May also enhance mitochondrial output for increased energy (but that seems to be more attributed to R-Lipoic Acid). More on Alpha Lipoic Acid. Vinpocetine – Is it organic or synthetic? 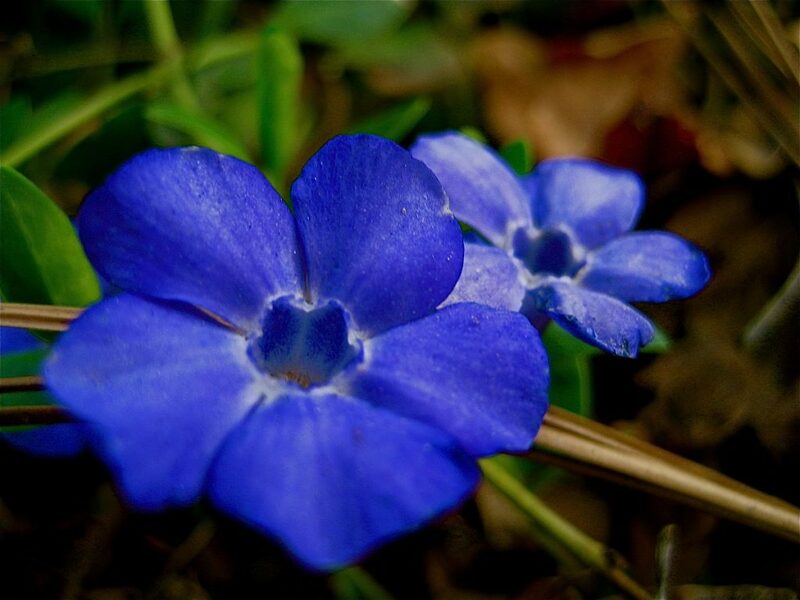 Vinpocetine, the synthetically derived compound from the natural Periwinkle plant, may greatly improve cerebral circulation in tiny doses, delivering more oxygen & nutrients (i.e. fuel) to the brain. More on Vinpocetine. Huperzine A (from Toothed Clubmoss Aerial Parts Extract) – Another semi-synthetic, semi-natural compound that exerts major bio-effects in tiny doses. Seems to enhance brain chemical status, most notably by inhibiting acetylcholine breakdown. 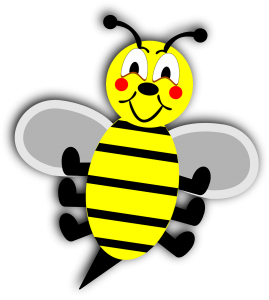 More on Huperzine A.
Caffeine Anhydrous (150 mg) – i.e. caffeine powder. Ever heard of caffeine? it’s in practically everything these days, including our nootropic stacks, which… meh, fine, but I don’t consider it to be a true brain healthy nootropic. 150 mg Caffeine equals nearly 2 cups of coffee. Can Adderall be adequately replaced by non-drug substances? Needless to say, Profiderall is appealing to the “smart drug” Adderall crowd, offering a potentially valuable healthy alternative to the amphetamine-driven creations of our money-hungry pharmaceutical drug dealers. As tacky as these “-erall” titled knock off brands are, I do appreciate them for expanding our cognition enhancing options outside of the likes of Adderall, Ritalin, Modafinil, etc., etc. And Profiderall definitely qualifies as a healthier alternative to these smart drugs, but is it a good healthier alternative? How does Profiderall rank on the nootropic scale? The Dosages. Or rather the dosage, because we can’t see the dosages. With exception to the B Vitamins, which are all heavily dosed, the overall dosage of Profiderall’s proprietary blend is questionable, considering that the first two ingredients alone require a higher combined dosage than 466.05 mg. The fact that Profiderall uses a proprietary blend at all is questionable. Seeing the low quality of most of the ingredients only further diminishes my confidence in the blend. Not to say that the ingredients are outright bad choices. Bacopa is one of my favorite nootropic herbs. Choline is great for cognition. And the Taurine & Tyrosine combo delivers the good effects of energy drinks, minus all of the junk & sugar. Yet, Bacopa Extract (for bio-active bacosides) would have been better. The Choline is in a non-nootropic form. And the L-Tyrosine should be N-Acetyl-L-Tyrosine. Profiderall sells itself as a worthy alternative to Adderall, but comes across as a cheap, knock off alternative to energy drinks. Which isn’t a bad thing if you’re looking for a mood-enhancing, nootropic source of caffeine. But I wouldn’t necessarily consider Profiderall as a proper brain health bio-hacking tool. ^ FAIR WARNING: Don’t overdo it on Profiderall dosages. Especially if you’re caffeine sensitive. As a caffeine supplement, Profiderall works, notching in an impressive list of bona fide nootropics to accompany caffeine’s jittery stimulation. The B vitamins, Taurine, & Tyrosine seem to provide the feel-good effects of energy drinks, enhancing focus without the nasty sugar rush. Profiderall’s website offers in-depth descriptions of each individual ingredient in addition to how its formula is intended to work. 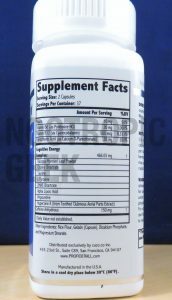 The dosages are fine on the B vitamins, but are a major issue on the proprietary blend, which contains most of Profiderall’s nootropic bio-actions. Profiderall’s website explains the purpose of its ingredients, yet cites research that has almost nothing to do with anything in this formula (e.g. “Changes in lower urinary tract function in children with hyperactive urinary bladder treated with combined therapy” (study)). Profiderall appeals to college students, twenty-something workers, and party animals. Its emphasis on stimulating feel-goods has less to do with brain health than quick spurts of mental energy. Profiderall can be ordered through the product’s website. 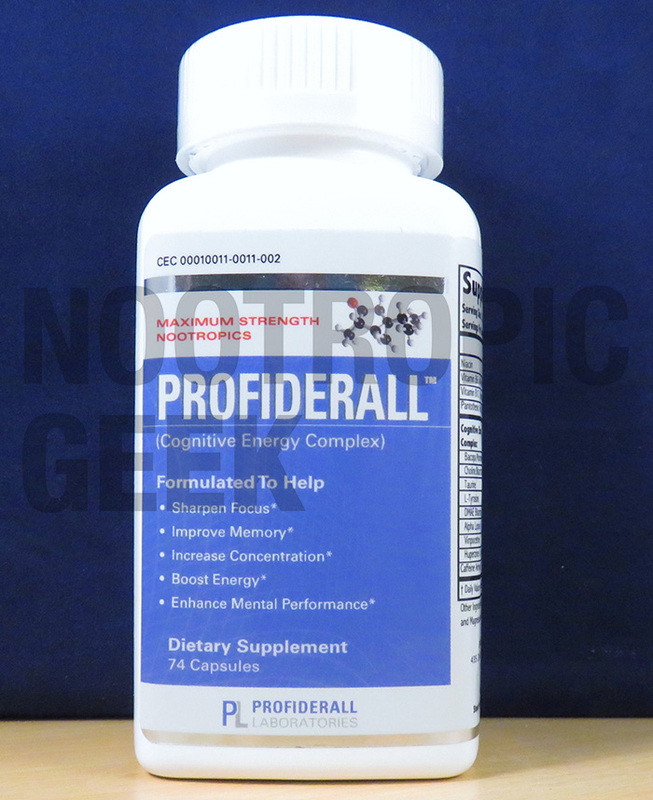 The biggest complaint against Profiderall is that its dosages are too low to have any significant nootropic effect. Asides from the B Vitamins & Caffeine, of course. In defense of Profiderall, we can’t even see all of its dosages, so who knows exactly what’s going on inside of its blend (that’s not a really good “defense,” is it)? 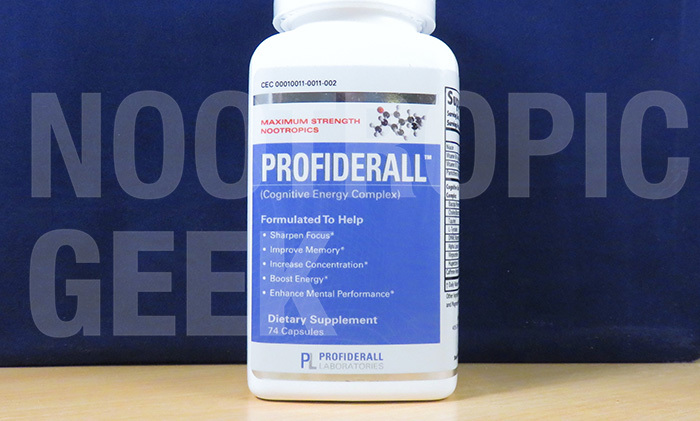 Having said that, you can be confident that Profiderall will work as caffeinated “energy drink” alternative, given its supply of B vitamins, amino acids, & caffeine. I don’t know if it quite earns the status of “smart drug” alternative as I doubt that the formula serves any therapeutic potential with regards to ADHD, inattention, etc., etc. Yet, it’s definitely safer & cheaper, so I can at least recommend a try, iffen you’re lookin’ to buy.